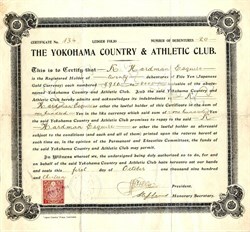 Beautiful RARE debenture certificate from The Yokohama Country & Athletic Club issued in 1913. This historic document was printed by "Japan Gazette" Press, Yokohama and has an ornate border around it with a rose-colored Japanese stamp. This item has the handwritten signatures of the Company’s President and Honorary Secretary, and is over 98 years old. The Yokohama Country & Athletic Club, founded in 1868 as the Yokohama Cricket Club, was Japan's first cricket team. It was founded by English merchants living in Yokohama, who played their matches on what eventually became the Yokohama Stadium. The Yokohama Country & Athletic Club still plays cricket today.